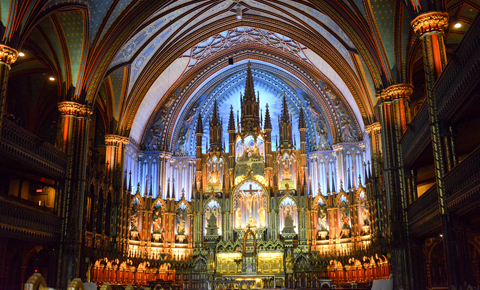 Step back in time and visit the “City of Festivals” with our Montreal and Quebec Vacation Package. Your vacation begins in downtown Montreal, a city that lives in both English and French, with on-trend and old world sights, and year-round festivals throughout the city. Enjoy your arrival evening on your own to sample the city’s dining and nightlife. A full-day “Hop On, Hop Off” tour, and a peaceful St. Lawrence River cruise showcase the city as you’d most love to see it. Highlights include Mt. Royal, Saint Joseph’s Oratory, Square Victoria, Place Jacques Cartier, downtown Montreal, Chinatown, and much more. Next, you’ll venture into the countryside along the St. Lawrence River to see Quebec City and Montmorency Falls. 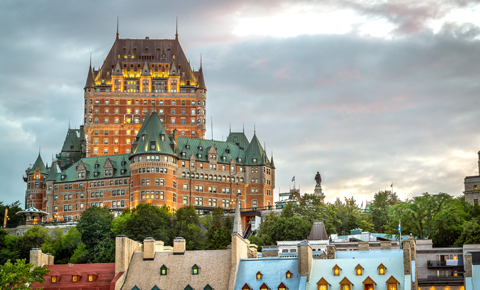 One of North America’s oldest European settlements, Quebec City is the capital of French Canada, with charming historic areas and scenic views. A UNESCO World Heritage site, Old Quebec’s walkable cobblestone streets usher you through the notable historic district. 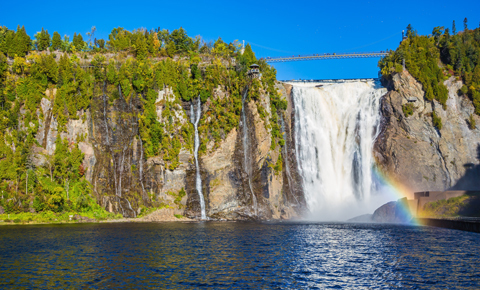 Outside the city, roaring Montmorency Falls are the highest in the province, and 98 feet (30 meters) higher than Niagara Falls. You’ll return to your hotel in Montreal for another evening to spend as you wish. A Deluxe Package is available featuring additional upgrades and conveniences throughout the vacation. 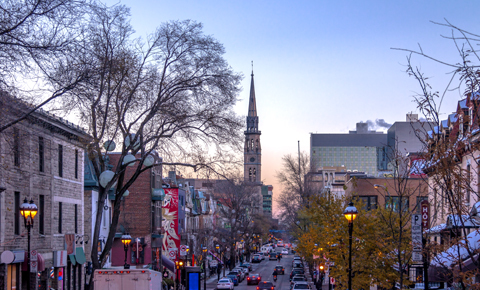 Stroll Rue Saint-Denis and come across Montreal’s varied boroughs and distinctive architecture. The north-south thoroughfare takes you to Old Montreal, the Latin Quarter, bookstores, bars, restaurants, and more. Montmorency Falls is located about 7.5 miles (12 km) from old Quebec City, where the mouth of the Montmorency River drops into the Saint Lawrence River. Spectacular views are found from vantage points. Montreal Botanical Garden is among the world’s best. 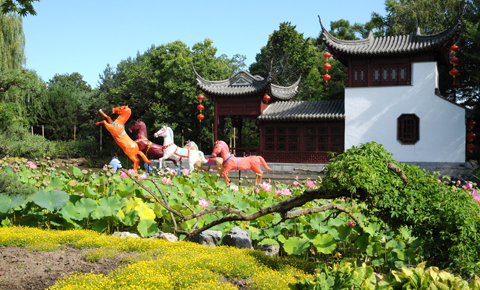 With an extensive 75 hectares (190 acres) of themed gardens and greenhouses, it was named a National Historic Site of Canada in 2008. Château Frontenac has a special place in Quebec City’s skyline. Located inside the fortress walls of Old Quebec, the historic hotel, originally built in 1893, still operates as a hotel today. Notre-Dame Basilica is a highly-decorated Gothic Revival-styled church in the historic district of Old Montreal. The first version of the Roman Catholic church was built on the site in 1672. A major attraction as one North America’s oldest urban areas, Old Montreal will win you over with lively, meandering streets and historic delights, with some buildings dating as far back as the 17th century. Our customizable Montreal and Quebec vacation packages include 3 night accommodations and multiple guided group tours. Take a stroll through Montreal and Quebec, discover Mt. 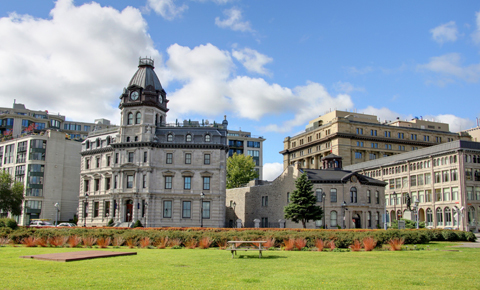 Royal, and Square Victoria, and experience Quebec City and Montmorency Falls tour. Free time for shopping in Montreal downtown. 24-hour Hop on Hop off Montreal with St. Lawrence River Cruise tour. Mt. Royal, Saint Joseph’s Oratory, Square Victoria, Place Jacques Cartier, Downtown and Chinatown. Full day group Quebec City and Montmorency Falls tour. Mt. Royal, Old Montreal, Chinatown, Norte-Dame Bascilica, Bonsecours Market, Latin Quarter, Saint- Laurent Boulevard, Golden Square Mile, Olympic Park and St. Lawrence River. Afternoon St. Lawrence River Cruise.